We were about 5 hours out of Frankfurt flying over the North Atlantic and I was in my crew rest seat taking my scheduled rest break. All of a sudden the curtains parted violently and I was told to go to the cockpit, right now, to see the captain. As soon as I got there I noticed the crew had one of those "All Business" looks on their faces. The captain handed me a printed message. I quickly read the message and realized the importance of it. The message was from Atlanta, addressed to our flight, and simply said, "All airways over the Continental US are closed. Land ASAP at the nearest airport, advise your destination." Now, when a dispatcher tells you to land immediately without suggesting which airport, one can assume that the dispatcher has reluctantly given up control of the flight to the captain. We knew it was a serious situation and we needed to find terra firma quickly. It was quickly decided that the nearest airport was 400 miles away, behind our right shoulder, in Gander, on the island of Newfoundland. A quick request was made to the Canadian traffic controller and a right turn, directly to Gander, was approved immediately. We found out later why there was no hesitation by the Canadian controller approving our request. We, the in-flight crew, were told to get the airplane ready for an immediate landing. While this was going on another message arrived from Atlanta telling us about some terrorist activity in the New York area. We briefed the in-flight crew about going to Gander and we went about our business 'closing down' the airplane for a landing. A few minutes later I went back to the cockpit to find out that some airplanes had been hijacked and were being flown into buildings all over the US. We decided to make an announcement and LIE to the passengers for the time being. 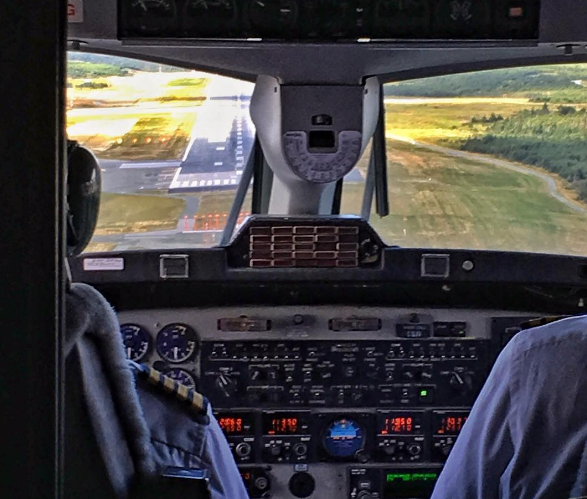 We told them that an instrument problem had arisen on the airplane and that we needed to land at Gander, to have it checked. 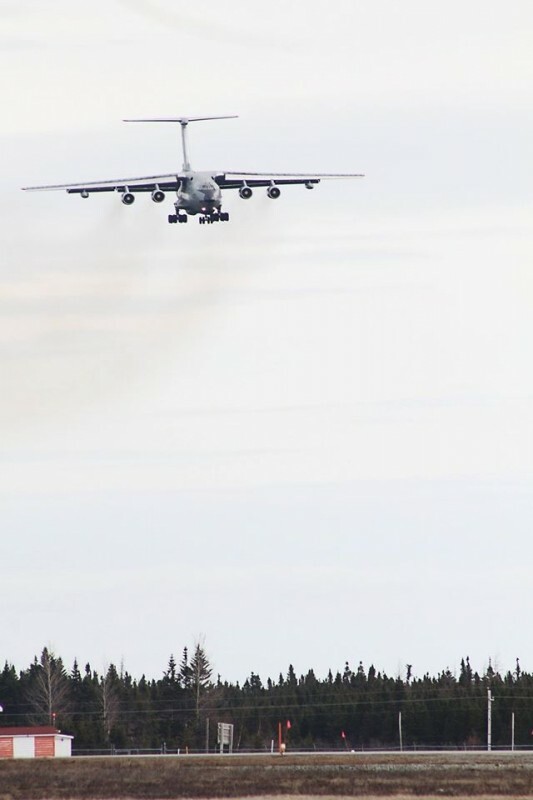 We promised to give more information after landing in Gander. There were many unhappy passengers but that is par for the course. Gander control told us to stay put. No one was allowed to get off the aircraft. No one on the ground was allowed to come near the aircrafts. Only a car from the airport police would come around once in a while, look us over and go on to the next airplane. In the next hour or so all the airways over the North Atlantic were vacated and Gander alone ended up with 53 airplanes from all over the world, out of which 27 were flying US flags. We were told that each and every plane was to be offloaded, one at a time, with the foreign carriers given the priority. We were No. 14 in the US category. We were further told that we would be given a tentative time to deplane at 6 pm. Meanwhile bits of news started to come in over the aircraft radio and for the first time we learned that airplanes were flown into the World Trade Center in New York and into the Pentagon in DC. People were trying to use their cell phones but were unable to connect due to a different cell system in Canada. Some did get through but were only able to get to the Canadian operator who would tell them that the lines to the US were either blocked or jammed and to try again. 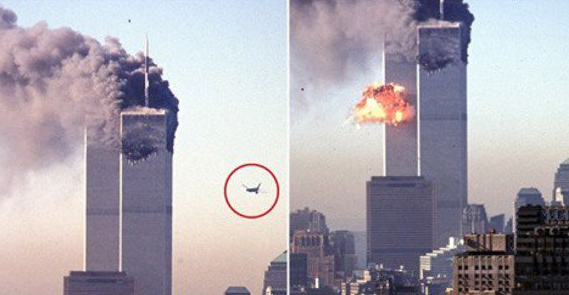 Some time late in the evening the news filtered to us that the World Trade Center buildings had collapsed and that a fourth hijacking had resulted in a crash. Now the passengers were totally bewildered and emotionally exhausted but stayed calm as we kept reminding them to look around to see that we were not the only ones in this predicament. There were 52 other planes with people on them in the same situation. We also told them that the Canadian Government was in charge and we were at their mercy. True to their word, at 6 PM, Gander airport told us that our turn to deplane would come at 11 AM, the next morning. That took the last wind out of the passengers and they simply resigned and accepted this news without much noise and really started to get into a mode of spending the night on the airplane. The town of Gander has a population of 10,400 people. Red Cross told us that they were going to process about 10,500 passengers from all the airplanes that were forced into Gander. We were told to just relax at the hotel and wait for a call to go back to the airport, but not to expect that call for a while. We found out the total scope of the terror back home only after getting to our hotel and turning on the TV, 24 hours after it all started. Meanwhile we enjoyed ourselves going around town discovering things and enjoying the hospitality. The people were so friendly and they just knew that we were the "Plane people." We all had a great time until we got that call, 2 days later, on the 14th at 7 AM. We made it to the airport by 8:30 AM and left for Atlanta at 12:30 PM arriving in Atlanta at about 4:30 PM. (Gander is 1 hour and 30 minutes ahead of EST, yes!, 1 hour and 30 minutes.) But that's not what I wanted to tell you. What passengers told us was so uplifting and incredible and the timing couldn't have been better. We found out that Gander and the surrounding small communities, within a 75 Kilometer radius, had closed all the high schools, meeting halls, lodges, and any other large gathering places. They converted all these facilities to a mass lodging area. Some had cots set up, some had mats with sleeping bags and pillows set up. ALL the high school students HAD to volunteer taking care of the "GUESTS." 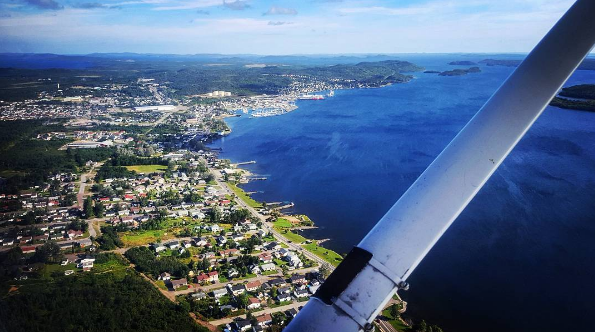 Our 218 passengers ended up in a town called Lewisporte, about 45 Kilometers from Gander. There they were put in a high school. If any women wanted to be in a women-only facility, that was arranged. Families were kept together. All the elderly passengers were given no choice and were taken to private homes. A young pregnant lady was put up in a private home right across the street from a 24-hour Urgent Care type facility. There were doctors on-call and they had both male and female nurses available to stay with the crowd for the duration. Phone calls and emails to US and Europe were available for everyone once a day. During the days the passengers were given a choice of "Excursion" trips. Some people went on boat cruises of the lakes and harbors. Some went to see the local forests. Local bakeries stayed open to make fresh bread for the guests. Food was prepared by all the residents and brought to the school for those who elected to stay put. Others were driven to the eatery of their choice and fed. They were given tokens to go to the local Laundromat to wash their clothes, since their luggage was still on the aircraft. In other words, every single need was met for those unfortunate travelers. After all that, they were delivered to the airport right on time and without a single one missing or late. All because the local Red Cross had all the information about the goings on back at Gander and knew which group needed to leave for the airport at what time. Absolutely incredible. When passengers came on board, it was like they had been on a cruise. Everybody knew everybody else by their name. They were swapping stories of their stays, impressing each other with who had the better time. It was mind boggling. Our flight back to Atlanta looked like a party flight. We simply stayed out of their way. The passengers had totally bonded and they were calling each other by their first names, exchanging phone numbers, addresses, and email addresses. And then a strange thing happened. One of our business class passengers approached me and asked if he could speak over the PA to his fellow passengers. We never, never, allow that. But something told me to get out of his way. I said "of course." The gentleman picked up the PA and reminded everyone about what they had just gone through in the last few days. He reminded them of the hospitality they had received at the hands of total strangers. He further stated that he would like to do something in return for the good folks of the town of Lewisporte. He said he was going to set up a Trust Fund under the name of DELTA 15 (our flight number). The purpose of the trust fund is to provide a scholarship for high school student(s) of Lewisporte to help them go to college. He asked for donations of any amount from his fellow travelers. When the paper with donations got back to us with the amounts, names, phone numbers and addresses, it totaled to $14.5K or about $20K Canadian. The gentleman who started all this turned out to be an MD from Virginia. He promised to match the donations and to start the administrative work on the scholarship." This is such a moving story and demonstrates that sometimes the best sides of humankind are brought out in emergency situations.